The ability to leave your family and loved ones protected after you are gone is paramount for most people. Life insurance has probably been around longer than you think. And, the history of its inception is rather interesting. 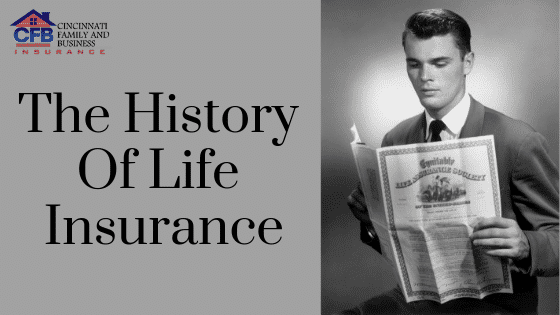 Here are some facts that you may not know about the history of life insurance. It first appeared in 100 B.C. In ancient Rome, Caius Marius contrived a way to help pay for his troops’ funerals. The Romans believed that the deceased must be properly buried or their spirits would not be at peace. So, Marius created a burial club where his troops would share in the cost of an unexpected death. It even evolved into providing some financial assistance to the survivors. The clubs became a thing of the past with the demise of the Roman Empire in 450 A.D.
Lloyd’s of London started out as a coffee shop. Much later, around 1688, merchants, seamen, and ship owners would gather at local shops for what we would now call networking. What started out as a place for men to get together and share news or trade-specific tales turned into a meeting ground for the financially resourceful who quickly saw the need for insurance for the various businesses. As the years passed, these shops evolved into places where business was conducted. One of those small shops was called Edward Lloyd’s Coffee House where a group of entrepreneurs began to organize the original version of our modern day insurance. They developed an underwriting group and opened a new gathering spot called New Floyd’s Coffee House, known today as Lloyd’s of London. The first life insurance company in America was in Philadelphia. Organized by the Presbyterian church for its ministers and their survivors, it was founded in 1759. The Presbyterian Synod of Philadelphia was the first organization in America to offer insurance to take care of funeral expenses along with survivor benefits. The Episcopalian church would follow suit a few years later. Charleston, S.C. can claim having the first insurance company in America. Founded in 1735, they offered fire insurance. The recession of 1837 spurred mutual fund supported insurance growth. With the economy in a down-slide, insurance companies realized the value of mutual funds requiring a minimal capital investment. The financial advantage of the mutuals, along with women being legally permitted to purchase insurance, resulted in tremendous growth for the industry. Despite the naysayers claiming that insurance companies were a form of gambling, this growth period was the beginning of some of the big names in insurance that we know today, such as John Hancock, New York Life, MassMutual, and MetLife. Insurance changed drastically in 1875. The depression in the early 1870’s would end up costing policyholders $35 million. It caused 46 insurers to stop operating for reorganization purposes and 32 of those companies went out of business. What we now know as Prudential began in 1875 in Newark, N.J. Originally named Widows and Orphans Friendly Society, they only sold burial insurance and it was affordable to the working class. Pantasote Leather Company can claim the rights as the first company to offer group life coverage for its employees. Offered by Equitable Life Assurance Society currently known as AXA Equitable, it covered the employees without the need of medical exams or applications. Montgomery Ward would soon begin offering the same coverage. World War I spurred growth. After the war and the Great Depression in the 1930’s, there were an estimated 120 million insurance policies for the sole purpose of covering burial costs and providing money for survivors. In 1965, it was available in the American military. Armed force members on active duty in Vietnam were the first to be covered by Serviceman’s Group Life Insurance. Because of the high probability of death while serving our country, the federal government covered the administrative costs and funded the underwriters to make this insurance possible. By the 1970’s, seventy-two percent of our population was covered. The economic upswing also enabled over ninety percent of all married couples to be insured. Over $1.2 billion was paid out to insurance policyholders after the terrorist attacks on Sept. 11, 2011. Insurance coverage is now seeing a 50-year low. As of 2010, insurance designed to protect your loved ones after you die was only being taken advantage of by forty-four percent of the population leaving over thirty-five million people without any coverage at all.